This is my daily driver. 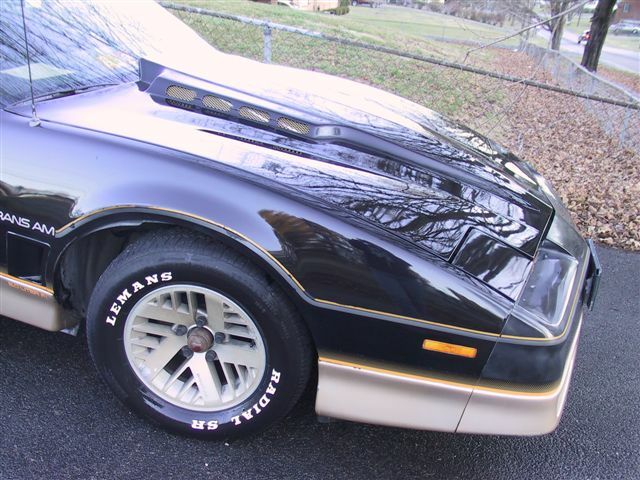 It is the third Trans Am style made in 85. Basically it's an 86. The car started life with a 305 TPI engine and a 700R4 trans. The 305 has been ditched for a built 377 and the 700R4 has been built to keep up with it. It has an American Sports Car Designs Turbo hood, and a 2200 watt stereo containing 2 15" Kicker subs in a 6 cubic foot fiberglass enclosure that is molded to the body of the car, along with 10 other speakers, 4 amps, 1 crossover, 1 in-dash Sony EQ and an in-dash CD/MP3 player. The car has every single option available in 85 with the exception of the digital dash (which I now have in a box in the basement as a future project ;) Click on a thumbnail to enlarge. Once enlarged, click your back button to come back to this page.